After centuries of colonial appropriation of its traditional territory, today the Tapeba Indians are confined in an area of only 4 thousand hectares on the outskirts of the municipality of Caucaia, Ceará. Even this small area is now threatened by a variety of economic activities that impact directly on the traditional way of life of this people. They face strong political opposition at the municipal level, since the family Arruda, who has dominated the local political field for decades and politicians have committed resources to prevent the advancement of the process of demarcation of their lands. According to the anthropologist Henyo Barreto, since 1985 the Tapeba people have struggled to ensure their permanence in the remaining lands of their ancestors. That lands are still considered as Union lands, but have not yet been recognized as indigenous lands. In that fight, they face prejudice and discrimination of local society, which does not recognize them as ethnically differentiated people as well as the State who has put in doubt their indigenous ancestry. In 1988, for example, an inter-ministerial group, assigned to analyze the administrative process that would meet the territorial demands of the people, filed a procedure for considering doubts as to its legitimacy, and requiring additional ethnographic studies. This decision was rejected by local indigenous organizations and Tapeba support groups. Since then, the Fundacao Nacional do Indio (FUNAI) has repeatedly reaffirmed the legitimacy of the demands of the Tapeba. In 1989, FUNAI reopened the administrative process of demarcation and in 1997 published an Ordinance recognizing part of the area traditionally occupied by the Tapeba as indigenous lands. The administrative decision of FUNAI depended on a presidential decree to be approved, but since that year, it has often been questioned in court by farmers and local politicians. In 2002, for example, then-mayor José Gerardo Arruda obtained the annulment of the order by a writ of mandamus granted by the Superior Tribunal de Justica (STJ), which forced the FUNAI to start a new administrative process with additional studies. Meanwhile, the STJ received new judicial disputes of the demarcation process, causing it to be paralyzed for several years. At the same time as the legal dispute for the possession of lands continues, the Tapeba Indians have suffered with the installation of several enterprises in its traditional territory: the condo Farm Soledade installation; the Brazilian Technique of Food (TBA) and Cerapeles industries work in their territory; the installation of the garbage chute of urban cleaning company; clay exploitation in Tapeba lands by potters, and the project of transposition of water from the Castanhão Dam to the metropolitan region of Fortaleza, with the use of pipelines and a pipeline system that cuts across the Tapeba lands in Caucaia. Nevertheless the Tapeba people have gotten support from various civil society organizations and achieved some important political victories. In 2007, a petition circulated on the internet touting support for the struggle of the Tapeba Indians. In August of that year, the Ministerio Publico Federal (MPF) obtained a court ruling that suspended clay exploitation in indigenous lands. In 2011, they performed a public act of protest grid with the support of the Tremembé and Pitaguary Indians, a result of growing links between the indigenous peoples of Ceará. However, if a few victories were achieved, there were also losses. In June 2012, the Court granted an injunction of repossession that ended with the expulsion of the Tapeba Indians from the village of Sobradinho from their homes and the destruction of the village by shock battalion of the military police. They remain subject to this type of institutional violence, because they have not yet succeeded in the demarcation of their traditional lands. Name Tapeba Indians threatened by companies and public policies in Caucaia, Ceara, Brazil. Why? Explain briefly. They have not yet succeeded in the demarcation of their traditional lands. INSTITUTO SOCIOAMBIENTAL. Populacoes indigenas do Brasil. Tapeba: Informacoes gerais. Disponivel em: Acesso em: 09 mai. 2009. 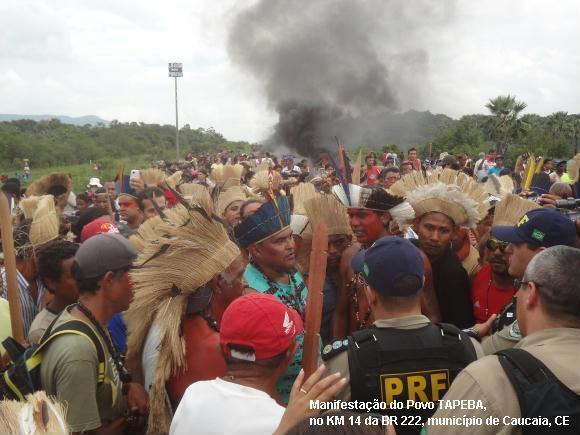 INDIOS realizam manifestacoes amanhã no IBAMA e Semace contra degradacao ambiental e licenciamentos em Terras Indigenas. Combate Racismo Ambiental, 14 set. 2011. Disponivel em: Acesso em: 28 jun. 2013. INDIOS Tapeba realizam protesto contra Eixao das Aguas. Combate Racismo Ambiental, 03 nov. 2011. Disponivel em: Acesso em: 28 jun. 2013. MOREIRA, Aline. Tapebas bloqueiam rodovia em protesto. O Povo, 03 jul. 2012. Disponivel em: Acesso em: 25 jul. 2013. RIZZO, Alana. Transposicao do Sao Francisco tem 10 investigacoes do MPF em curso. O Estado de São Paulo, 18 jan. 2012. Disponivel em: Acesso em: 25 jul. 2013. URGENTE: Agora, em Caucaia, Ceara, manifestacao Tapeba contra Reintegracao de Posse. Combate Racismo Ambiental, 10 jul. 2012. Disponivel em: Acesso em: 25 jul. 2013.